So that you can forward plan effectively, your Current RMS system assumes that products will return to availability from an opportunity based on either the end date (when using the extended scheduler) or pickup date (for the standard scheduler). 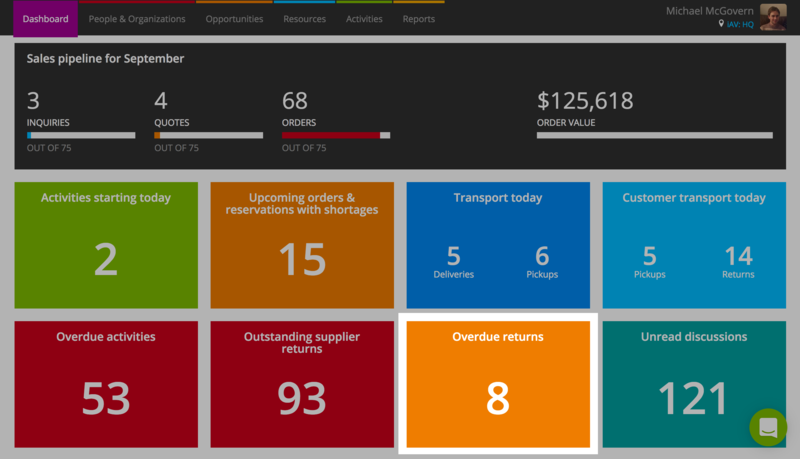 When stock hasn’t been checked-in and finalized after the end or pickup date of an opportunity, the opportunity shows up in the “overdue returns” tile on your dashboard. This allows you to easily view all opportunities that haven’t yet come back, so you can change the end date or move outstanding items to a new opportunity. If you wish, you can configure your Current RMS system so that it automatically sets opportunities where the end or pickup date has elapsed to open ended rentals. When an opportunity is marked as an open ended rental, stock on it is booked out indefinitely until the items have been checked-in and finalized. To enable, head to System Preferences and toggle “Auto convert overdue bookings to open ended rentals” to YES – it’s under the Product Settings heading. Once turned on, Current RMS checks for overdue returns once an hour and changes the opportunities so that they’re open ended. When this happens, the owner user set against the opportunity and any participants that are users receive a discussion message letting them know of the change. This message will also detail any products or assets that are now overbooked, i.e. future opportunities that have been impacted because this opportunity is now open ended. Your customer does not receive this automatic discussion message; they are added as a muted participant to the discussion and will not receive any messages on the thread unless un-muted. What happens if I have enforce stock availability enabled? In this case, a shortage will be created. Any shortages will be highlighted in red on that particular opportunity.